Experience shows that the companies that stay innovative are the most likely to succeed and thrive. They must constantly look for the latest emerging trends and incorporate the most relevant ones into their business strategy. Not surprisingly, these companies are usually the ones that have the highest engagement of their most important creative resource – their employees. Texas companies like Southwest Airlines, Whole Foods, and National Instruments are excellent examples of innovative companies that have gained from the high engagement of their workforce. What traits are the most important to employees, and consequently to the overall business? According to the Austin Business Journal’s Top Workplaces 2014 Survey, employees are looking for companies that value them as individuals, care about their opinions and ideas, and are always striving to improve. How does an organization marry this ideal of finding emerging trends and engaging their employees, and in the process, improve their bottom-line? City of Austin’s Chief Innovation Officer Terry O’Connor emphasizes an innovative mindset as being the key component to innovation. How is such an innovative mindset created? One way is to incorporate minitrends into an organization’s planning and strategic process. 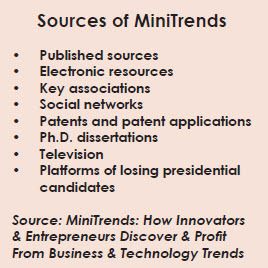 What are minitrends? They are trends that promise to become significantly important within a short period of time – about 2-5 years – but that most people or businesses do not yet recognize or appreciate. Unlike megatrends, they are of a scope and importance to present attractive business opportunities to businesses of all sizes. Having an action plan to find and take advantage of these trends provides the perfect opportunity to mine the creativity and imagination of an organization’s best thinkers. The first step is to set up a team for scanning the environment for minitrends that suggest opportunities and may lead to profitable products or processes. The team should be motivated and forward-thinking with a commitment to a regular schedule and an on-going process. All ideas should be recorded and shared. Inclusionary tactics such as surveys and feedback tools for gathering input from a broader group within the organization encourages even more engagement. There are many avenues for finding minitrends such as “searching for convergences” and “analyzing frustration.” For example, in the case of searching for convergences, Mason Arnold noted an increasing interest in organically-grown food, locally-grown food, and in reducing shopping time. He established Greenling Company in Austin in 2005 combining all three. It now delivers homegrown, organic food to the doorsteps of its customers throughout Central Texas and continues to expand. In the case of analyzing frustration, Reed Hastings turned his frustration over a $40 fine for not returning a movie to a rental store on time into a new rental model that became Netflix. The company went on to ride the wave of streaming video and continues to stay vigilant looking for emerging trends of the future. According to a recent study, two-thirds of useful information comes from discussions with colleagues and one-third from literature. Of the third found in the literature, more than half were recommended by colleagues. Advocating for employees at all levels to hear guest speakers, to attend conferences, participate in professional activities, and connect with the community are great ways to assist them in finding valuable minitrends and being inspired by great ideas. National Instruments sponsors a Toastmasters Chapter and NI employees are offered free memberships. In addition to improving their speaking and communication skills, NI members get to hear fellow employees, as well as members from outside companies, share and expand on new ideas. Texas Mutual Insurance has a wonderful program of periodically inviting outside speakers to agency meetings in order for attendees to examine trends, understand what the trends mean to their businesses, and consider how they might think about and act on potential future changes in the business environment of Texas. Laughter and interaction bring the connection and caring that the human soul craves. Making a point to integrate fun and humor into the innovative process in tangible ways that reflect the uniqueness of a company’s particular culture pays off with great ideas. Whether it’s Southwest Airline’s “fun-luving” attitude and antics or Greenling Company’s associate names like “Cookie Monster” and “Bringer of the Good Thyme,” every company can find fun ways for their employees to interact with each other that encourage imagination, creativity, and a sense of well-being for all. With minitrend ideas pouring in, the next step is to have a process to access and decide which ones have potential for successful implementation. There are tools to encourage inclusion of the expertise and experience of a wide range of in-house participants, as well as other stakeholders like suppliers, customers, etc. For example, with the “Opportunity Wheel” tool, a topic is chosen and written in a circle on a large sheet of paper and then direct and indirect opportunities arising from the topic are mapped out. The Opportunity Wheel allows participants to explore the realm of the possibilities and to increase awareness of non-obvious implications. Even the ideas that don’t make the cut should be captured and reviewed periodically. Incorporate the most promising minitrends into the organization’s business strategy. The most successful ideas pave the way for the next round of minitrends that are just around the curve. How opportunities are best implemented depends on the size, nature, goals, and resources. In some cases a new venture makes sense; in others an improvement in present products or processes; and sometimes acquiring or partnering with other companies is the best path. By creating engaging opportunities for all levels of employees to find and take advantage of emerging minitrends, organizations can combine the crucial elements of engagement and innovation to create the best future for the organization and its stakeholders. This is truly the secret ingredient to a great place to work, and to having employees who are pillars to a company’s success rather than so many scaffolds. Recognizing and taking advantage of emerging mini-trends: sound advice for successful business strategies. An interesting read! indeed, good points. Many companies have started implementing “interpreneurial” activities to trying and get more employee engagement and creativity.